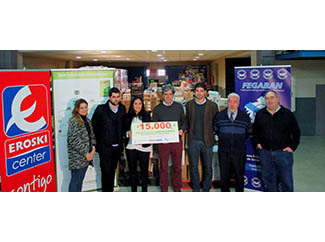 Humana and Vegalsa-Eroski have today presented an aid of 15,000 euros to the Galician Federation of Food Banks (Fegaban) to purchase staples. The management and development of the 350 tons of used clothing and shoes collected by the Foundation during 2014 in the containers located in the Eroski / Center establishments in Galicia, have provided the resources necessary for this contribution. Fegaban President Jose Pita, has been in charge of receiving the donation of the hands of Gabriela González, Director of External Communications, CSR and Customer Vegalsa-Eroski area, and Gustavo Pampín, Department of Human Development, a act that has developed in the facilities of the Galician Federation of Food Banks in the Estate of Tambre. Currently, the Foundation has 53 textile collection containers used in 49 outlets distribution company in different locations throughout Galicia. 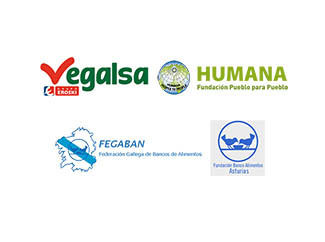 Today also, in addition, Humana and Vegalsa-Eroski have made delivery of 2,500 euros to the Food Bank of Asturias. This amount must also be of the resources generated with the valuation of textiles recovered containers on Vegalsa establishments. Responsible for collecting the contribution has been the vice president of Banco de Asturias Food, Bernardo Sopeña.